You walk while it works. The Model 88 is almost as easy to use as a lawn mower. You push 10 ft. cable sections into the line until you reach some resistance. Then attach the cable to the machine, stand behind it, and turn it on. Cables snap together in a second and are taken apart quickly. 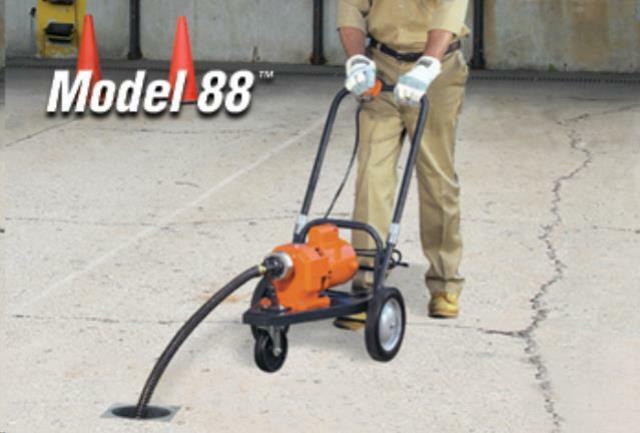 It handles jobs up to 150 ft. long in 3" through 10" lines. * Please call us with any questions about our drain cleaner 150 rentals serving Princeton, Vincennes, Evansville, Gibson County, and surrounding communities in Southwestern Indiana.